The FCC plans to consider millimeter-wave spectrum, over-the-air reception devices (OTARD), voice service “rate floor,” forbearance, and media items at its April 12 meeting, FCC Chairman Ajit Pai announced today. The FCC plans to release the text of the draft items along with the tentative agenda tomorrow. Mr. Pai said in a blog posting that he will ask his colleagues to consider a public notice proposing procedures for an auction of the 37 gigahertz, 39 GHz, and 47 GHz bands planned for later this year. He noted that it would be the third sale of millimeter-waved spectrum in 2019, following the 28 GHz band sale earlier this year and the 24 GHz band auction underway. Last August, the FCC unanimously adopted a fourth further notice of proposed rulemaking, proposing steps to get the 37 GHz, 39 GHz, and 47 GHz bands ready for a planned auction in the second half of this year (TR Daily, Aug. 2, 2018). The agency adopted a fourth report and order in the proceeding last December (TR Daily, Dec. 12, 2018). “The public notice makes proposals and asks questions about the essential features of this auction. For example, with respect to auction procedures, we're seeking comment on plans for a new incentive auction, in which we propose to use an ascending clock auction format for the offered licenses and then hold a sealed-bid assignment phase,” Mr. Pai said. “We also propose offering 100 megahertz blocks of spectrum licensed by Partial Economic Area service areas. In combination, the upper 37 GHz and the 39 GHz bands would offer the largest amount of contiguous spectrum in the millimeter wave bands for flexible-use wireless services — a total of 2,400 megahertz. And the 47 GHz band, no slouch itself, will provide an additional 1,000 megahertz of millimeter wave spectrum for such services. Combined with the two preceding auctions, the Commission will be making available almost five gigahertz of spectrum for commercial use this year. The report and order on the 37 GHz band concerns the 37.6-38.6 GHz band. Mr. Pai also said the FCC will consider an item that will make progress on the wireless infrastructure front. “We currently have rules on the books that prohibit state and local restrictions that unreasonably impair the ability of users to deploy what are called ‘over-the-air reception devices.’ But these rules were developed a long time ago. They had in mind the delivery of video services, not broadband. So they don't apply to antennas operating as hub or relay antennas used to transmit signals to or receive signals from multiple customer locations — in short, the kind of equipment that could be used for innovative new wireless services,” Mr. Pai said. “On April 12, the FCC will vote on a proposal to update these rules. We'll aim to pave the way for next-generation networking technologies that operate over millimeter waves, specifically, things like the base stations and hubs that make up mesh networks — modern-day over-the-air reception devices, so to speak.” The OTARD item is an NPRM. Chairman Pai also said that he hopes his fellow Commissioners will vote to eliminate the voice service rate floor, or minimum monthly subscriber charge by carriers that receive universal service high-cost support, which has been frozen at $18 since 2017. The freeze is scheduled to expire July 1, and increases in the rate floor, which is the urban average monthly rate determined by the FCC’s urban rate survey, mean that the rate floor would increase to $26.98 on July 1 absent FCC action (TR Daily, Dec. 21, 2018). Section 10 of the 1996 Telecommunications Act, which granted the FCC forbearance authority, states that if the FCC does not act on a petition for forbearance within one year, it will be deemed granted. The Commission can grant itself one three-month extension for consideration before the deemed-granted provision would take effect. In an order in WC docket 18-141, the FCC’s Wireline Competition Bureau recently granted the three-month extension, until Aug. 2, of the deemed-granted date for the USTelecom petition (TR Daily, Feb. 14). In provisions of the petition not mentioned by Chairman Pai, USTelecom had sought nationwide forbearance from the unbundling and resale mandates in section 251(c) of the 1996 Act and associated obligations in sections 251 and 252; provisions governing the relationships of Bell operating companies and their affiliates in section 271(e)(1); and the mandates for Bell operating companies to provide nondiscriminatory access to poles, ducts, conduits, and rights-of-way in section 271(c)(2)(B)(iii) (TR Daily, May 4, 2018). As a result of numerous mergers and acquisition over the past 23 years, AT&T, Inc., Verizon Communications, Inc., and CenturyLink, Inc., are the remaining successors to the seven companies that were subject to the Bell-specific provisions of the 1996 Act. The forbearance authority in section 10 is limited with respect to section 251(c) and section 271. 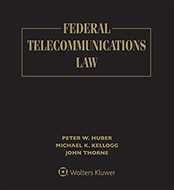 “Except as provided in section 251(f) [which deals with exemptions from incumbent local exchange carrier unbundling, interconnection, and collocation requirements for rural ILECs], the Commission may not forbear from applying the requirements of section 251(c) or 271 under subsection (a) of this section until it determines that those requirements have been fully implemented,” the 1996 Act said. Finally, Chairman Pai said he would ask his fellow Commissioners to eliminate a requirement for cable TV system operators to maintain paper copies of their channel line-ups in their local offices.